All hail the subkick mic. All hail the latest version of the subkick - the DW Moon Mic. So many engineers swore by the homemade subkick mic (originally made from the woofer of a Yamaha NS10 monitor) to capture the ultra-lows of a kick drum that Yamaha eventually came out with their own factory version of it called the SKRM 100. Unfortunately most engineers who had used a homemade subkick mic previously weren't entirely happy with the SKRM, since the sound definitely changed, likely due to the speaker housing and different driver used. Enter the DW DK27 Moon Mic, which is the next generation of subkick mic. 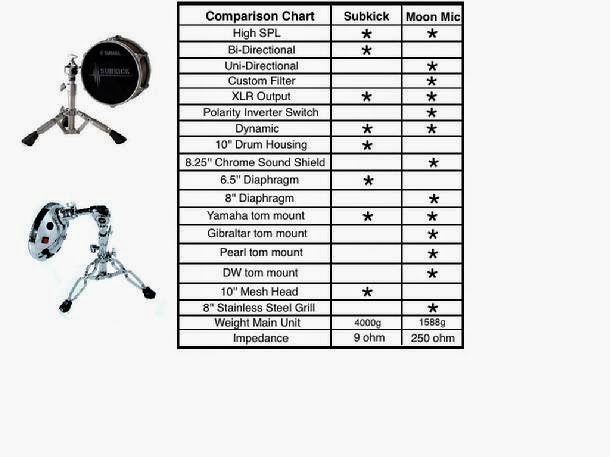 The Moon Mic is different in a variety of ways from either a homemade or Yamaha subkick (see the comparison chart on the left). First is the fact that it uses an 8" woofer instead of a 6 1/2" like the Yamaha, and has an extended frequency range so it picks up more than just the ultra-lows of the drum. Then it's directional so there's better isolation that what you get from the bi-directional Yamaha version. It also has a higher impedance, eliminating the need for a pad, and a built-in phase invert switch. Add to that the fact that it can be mounted with a variety of different hardware, including a traditional mic stand, and you have a next generation subkick mic. More information can be found at moonmics.com or in the video below. The DK27 retails for $399.